I believe there is a step missing from the power clean teaching progression. The book contains a strong implication that, during the power clean, the bar is in contact with the body all the way up to the jumping position. However, this is not possible. I believe that the jumping position can only be reached after the jump has already been initiated and that the bar must travel past the knees in a vertical line for some distance prior to initiating the jump (double knee bend). The following are citations from the book where it suggests that the lifter must drag the bar from the starting position to the jumping position (mid-thigh) prior to initiating the jump. 1. PG. 187 of the book discusses the jumping position and how one must feel the bar on their thighs prior to catching the bar on their shoulders. 2. Fig. 6-13 on pg. 188 shows the jumping position with the bar touching around mid-thigh. 5. Step 3 of the power clean teaching progression: from the starting position (i.e. bar is on the floor) (pg. 190) – “slowly drag the bar up the shins, past the knees, to the jumping position, and then jump and catch the bar”. 7. First paragraph of pg. 192. Figure 6-15 (figure on the left) also shows the correct jumping position (i.e. mid-jump – knees already bent) but the book does not really address arriving at this position. Arriving at the jumping position is only possible once the double knee bend has completed. In other words, the jumping position (i.e. the bar touching mid-thigh) is only possible after the lifter has dragged the bar past their knees. Once past the knees, the bar continues upward for a bit (without touching the body), the lifter initiates the jump which forces them to re-bend their knees (now the bar touches mid-thigh), the lifter jumps and extends, and racks the bar. Even though pg. 194 mentions that re-bending the knees occurs naturally, this statement now seems like a big deviation from the teaching method above. Especially since the movement has so much in common with the deadlift where the lifter drags the bar straight up with zero knee bend after clearing the bar above the knee. This would lead the lifter/reader to believe that they must drag the bar up all the way to mid-thigh (jumping position) before even initiating the jump. There seems to be a crucial middle step missing between dragging the bar past the knees and reaching the jumping position. I.e. when to actually bend the knees after the bar clears them. If the double knee bend is to happen naturally, the lifter/reader must know when to initiate the jump. However, that initiation cannot happen when the bar is in contact with the thigh. It also cannot be that the lifter instantly re-bends their knees after the bar clears them. There is definitely a space after the bar clears the knees and before the jump is initiated (i.e. the double knee bend) where the bar is ahead of the lifter (or still traveling in a straight line from the floor). We can see how the bar clears his knees and travels up, in a straight line, before he initiates the jump with the double knee bend. 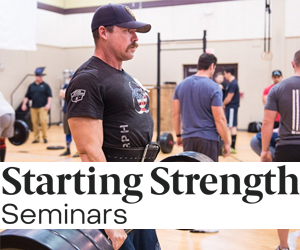 The power clean teaching method and the post-instruction power clean are not the same thing. If you teach it the way we do, the result is the correct clean with a correct second pull. This is demonstrated and discussed at every seminar. Lasha has a pretty bad arm pull. Can you help him with that? After having attended a Starting Strength deadlift/power clean camp and learned the SS Power Clean technique about 27 hours ago I'll say that the part you're missing is Emily and Diego yelling "Lats!" In all seriousness, much like the deadlift, the bar only lost contact with my legs when I didn't have a tightly set upper back and push back with my lats. Your main point is in conflict with your main line of reasoning. At every turn, you merely assert that something "cannot be", yet you never explain why. It's never clear to me why these things cannot be. You then point to a world class clean and jerk where the bar is only in contact with the thighs right before the jump, yet never argue what your example is doing there. If anything, its success demonstrates that the bar needs to be in contact with the thighs before the jump, however briefly. Your main point is also lost in your main post. You begin by talking about the teaching method and how one crucial step is missing. Assuming that "bend your knees again above the knee" is a crucial step, verbatim, you go on to say that this step isn't in there. However, the book acknowledges the double knee bend and argues that it is more efficient to think about keeping the bar in contact with the thighs along the way than to think mechanically about your knees and hips. In other words, it is not as efficient to think "ok, now I need to bend my knees a smidge". But then you say that people can't keep the bar in contact all the way, which is false, as anyone who has deadlifted/cleaned/snatched or watched others perform this lift will know. So this point only seems valid if you rephrase it to "the book doesn't advocate you think about bending your knees again above the knee", but then this doesn't seem to be a problem to me. It's pretty simple. The bar has to travel in a straight line from the ground. If the bar ends in the jumping position (i.e. with knees bent), the only possible way it got there is either: 1. the lifter dragged the bar past the knees (while maintaining contact), continued dragging the bar for a small distance where the bar is away from the body (still a vertical bar path), then initiated the jump by bending the knee (which is when we have contact again). OR 2. the lifter dragged the bar past the knees (maintaining contact), then slowly bends their knees as the bar moves past (bar maintaining a vertical path). However, the second instance does not make sense and is incorrect. Moreover, you are wrong when you say that you can keep the bar touching the body all the way through to the jumping position. I challenge you to find me one video or one example where that is the case. I am positive that you cannot. Yes, that is the case for deadlifts. However, that is not the case for any lift that includes a clean. Lastly, my point was not about teaching the double knee bend. I fully understand that it's much better to teach a person to jump and have them perform the double knee bend themselves without thinking about it. My point was that the book strongly implies maintaining contact with the bar all the way to the jumping position. My position is that is not possible. Unless I am missing something.... which is why I made the post in the first place. Well, the reason I was confused is because when I was learning the power clean, I was trying to be strict to form, i.e. I was trying to maintain bar contact all the way to the jumping position. However, that is not possible. It also led the bar to fly too much forward, instead of up, since the double knee bend launched the bar away from my thighs. However, if I stay over the bar and let it move past my knees (at a distance from my thighs) before I initiate the jump, that seems to work much better. Have you considered that your setup might be in error? What does your deadlift look like? I can assure you you were thinking about "bend my knees, now". You won't find a single coach worth his or her salt that will cue you to "bend your knees". They may say something like "tight lats", "push the bar back into your thighs", "keep it close (to the chest)", or something like that. They will cue you to move a certain way, not to move one of your joints a certain way. The human body works much more effectively in this way. I can also assure you that not a single successful clean is performed without there being any contact with the thighs at any point whatsoever. You may choose to do the clean with the bar only in contact with your thighs at the very last moment before jumping, but you'll find that this only works for weights that are light enough to muscle up anyway. Once the bar gets too heavy and away from your thigh, you have let the bar drift forward of the midfoot, which will impact negatively: the bar speed, the upwards momentum, the bar position in the traverse/horizontal plane, and your landing after racking the bar successfully. You may catch the bar long enough for your balance to have shifted too far forward, leaving you to drop the bar again. This efficiency in keeping the bar close would be the primary reason for thinking about doing so, namely it is the only way to keep the bar as close to the middle of the foot as possible. No where did I mention in my original post that I want someone to coach the double knee bend. I just noticed an inconsistency. Perhaps there should be an intermediary step to let the lifter know to jump when the bar has reached a certain height. Again, I do not dispute that contact with the thighs is necessary. However, the maintained contact all the way to the jumping position is not possible - unless the weights are so low that you can pretty much do anything to them. I think you may be misunderstanding what I'm trying to say. Because this has nothing to do with the set-up. The bar in a clean or a deadlift travels in a straight line from the ground. In a deadlift, it travels to the knees, past the knees, and the hips start to straighten until lock out. All of this results in vertical bar path. The clean is similar. The bar moves in a straight line to the knees, then past the knees. Here is where it starts to differ from a deadlift. In order for you to jump, your knees need to come forward (double knee bend). To do this, they go under the bar as it is still traveling up in a straight vertical line. (Look at Fig. 6-15 on pg. 190) This is how you are put in the right position to jump. As you can see from the figure, this is the jumping position. This is where the bar touches mid-thigh and the lifter is about to jump. Just looking at the figure, it is clear that in order for the lifter to get into this position, the bar must travel in a straight line up to allow the knees to come under it. It can't make it there with your knees forward. You have to let the bar come up slightly before the double knee bend. i.e. the cue to jump does not happen while the bar is touching your thighs, it happens when the bar is just past your knees and away from your thighs. Perhaps there should be an intermediary step to let the lifter know to jump when the bar has reached a certain height. You said "you cannot find an example of..." and he provided an example. You don't get to point out an example where your assertion is supported and pretend they cancel out. That's not how logic works.